“For anyone interested in the origins, history, methods and spectacle of whole-hog barbecue, this book is essential reading...Fertel leaves readers hungry not only for barbecue but also for the barbecue country he so engagingly maps” (The Wall Street Journal). In the spirit of the oral historians who tracked down and told the stories of America’s original bluesmen, this is a journey into the southern heartland to discover the last of the great roadside whole hog pitmasters who hold onto the heritage and the secrets of America’s traditional barbecue. In The One True Barbecue, Rien Fertel chronicles the uniquely southern art of whole hog barbecue—America’s original barbecue—through the professional pitmasters who make a living firing, smoking, flipping, and cooking 200-plus pound pigs. More than one hundred years have passed since a small group of families in the Carolinas and Tennessee started roasting a whole pig over a smoky, fiery pit. Descendants of these original pitmasters are still cooking, passing down the recipes and traditions across generations to those willing to take on the grueling, dangerous task. This isn’t your typical backyard pig roast, and it’s definitely not for the faint of heart. This is barbecue at its most primitive and tasty. Fertel finds the gatekeepers of real southern barbecue—including those who tend the fire at legendary spots like Bum’s, Wilber’s, Sweatman’s, Grady’s, the Skylight Inn, and three different places named Scott’s—to tell their stories and pay homage to the diversity and beauty of this culinary tradition. These pitmasters are now influencing a new breed of chefs and barbecue enthusiasts from Nashville to Brooklyn. “With an anthropologist's eye and a glutton's appetite, Rien Fertel crisscrossed the American South on a pilgrimage to collect the wisdom of the great pitmasters, practitioners of the vanishing art of whole-hog barbecuing. Like all great food travelogues, you'll be tempted to consume this one in a single sitting." "Some barbecue cooks who still cook whole hogs the old way are just stubbornly doing what their people have always done. Others have studied the tradition and are reviving it in unexpected places. Not surprisingly, all are interesting characters, as Rien Fertel shows us in this fascinating book. A superb documentarian with a wry sense of humor, Fertel also offers some thoughtful observations about authenticity, gentrification, and celebrity. This book should be read by anyone who thinks barbecue is about sticky red sauce." "The One True Barbecue is the whole hog of storytelling-- sharp and witty prose, thoughtful interviews, and deep, humane insights into what makes these pitmasters cook." "Crackling with southern culture and history, Fertel's love for barbecue--from the pitmasters to the culinary traditions--is alive on every page. A joy to read and hog heaven for anyone who appreciates the nuances and delights of barbecue at its finest." "It is the stories of the pit masters and their predecessors, told with a sympathetic and fastidious eye, that give this hog its wings." 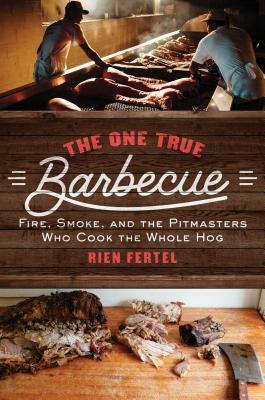 Race relations, religion, the New South versus the Old: These are just a smattering of the heavy issues James Beard Award nominee Rien Fertel writes about through the lens of—well—smoked meat in his new book, The One True Barbecue: Fire, Smoke, and the Pitmasters Who Cook the Whole Hog. And, while you might be thinking, "Oh, man, another book about barbecue? ", this one stands out from the crowd thanks to Fertel's superb writing and storytelling skills. In a book that's part culinary history, part personal narrative, and part tale of an American road trip (via RV, no less), Fertel travels throughout the South, documenting the men who have long stood behind the fires practicing the time-consuming pursuit of whole hog barbecue—the ones who have been keeping alive the embers of what once seemed like a dying art, and the ones who are inspiring a new generation of pitmasters today, even as far north as Brooklyn.